"Where are you going?" the Canadian immigration officer asked me as we stepped off the Amtrak train at Vancouver B.C. 's Pacific Central Station. Obviously we weren't the first ones to figure out we could take advantage of lower international airfares by flying out of Vancouver instead of Seattle. "About $250 per ticket," I said, telling him of our plans to fly to Lima, Peru on AeroMexico via a connection through Mexico City. 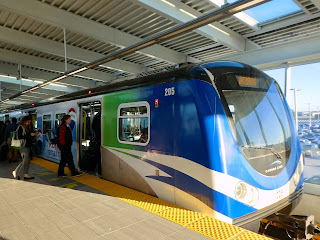 It was the third time in the past few years that my husband and I have made the trip140 miles north to Vancouver by train or bus to take snag lower fares on overseas flights. The savings this time was not as much as the $600 per ticket we netted a few years ago by flying Delta Airlines from Vancouver to Rome via Amsterdam and back from Berlin, but it was enough to justify the train fare ($75 for two) and four-hour ride. "Differences in supply and demand for individual cities," is likely one reason international fares are often lower, says Scott Mackenzie, editor of Seattle's Travel Codex, an online site that offers advice on airline pricing and award travel. "There may be more demand to fly in/out of Seattle due to Seattle’s comparatively larger economy and (presumably) wealthy businesses and residents who can afford to pay more for travel." He notes also that Vancouver has a larger international airport with more airlines competing on the same routes, and relatively relaxed customs procedures which make international connections easier. "If some passengers are already flying from Europe to Asia and stopping in Canada, then there is lots of supply for Americans (and Canadians) to take advantage of for at least half the journey." Whatever the reasons, you'll want to add up the cost, time involved and relative hassle or ease of traveling to Vancouver before making a decision. Start by comparing fares to the same destination on the same airline with similar flight times and connections. Search fare quotes for the same type of service: ie: economy coach vs. basic economy (cheaper but with many restrictions). Keep in mind, not all fares will be lower (some could be higher), or the savings might be too little to make it worthwhile. A check on Delta Air Line's website for mid-March, round-trip travel between Seattle and Rome, with a connection in Amsterdam, showed a fare of $1,384 vs. $1,069 between Vancouver and Rome, a savings of $315 per ticket for a main cabin economy coach seat. The savings was even greater on a Delta flight to and from Madrid through Amsterdam - $883 from Vancouver vs. $1,421 via Seattle. Lufthansa showed some of the biggest fare differences. Its website showed a fare of $2,295 for a round-trip Seattle-Berlin flight in March, with a connection in Frankfurt, on what it calls a "Basic Plus 1" fare (refundable with a fee) vs. $1,042 from Vancouver. On the flip side, A Delta non-stop between Seattle and Paris for March travel was $760 on the airline's website vs. $824 in and out of Vancouver with a connection through Seattle on the way over and Amsterdam on the way back. Tip: If comparing and booking fares online, be aware that some airlines quote fares on flights from Canada in Canadian dollars, meaning you'll need to do the conversion to figure out how much the fare is in U.S. dollars. Currently, $1 U.S. is worth $1.30 Canadian. Next, consider timing. You'll want to make sure you can get to Vancouver at least three hours ahead of your flight. Calculate if the savings is enough to justify the cost of spending the night. Otherwise, book a late afternoon or evening flight so you can get to Vancouver in the same day. If you are worried about being too tired to get back to Seattle from Vancouver after a long international flight, consider pricing what's known as an "open jaw," meaning you fly out of Vancouver but return directly to Seattle (We did this on our flight to Peru, opting to return directly from Mexico City to Seattle at a slightly higher cost than a Vancouver round-trip). * Amtrak offers operates two trains daily between Seattle and Vancouver and four Thruway buses. BoltBus makes 4-5 trips daily. All arrive at Vancouver's Pacific Central Station, where there's a SkyTrain light rail stop across the street, convenient for reaching the airport in about 40 minutes with a change at Waterfront Station to the Canada line. Taxis are also available. Both take about four hours. *QuickCoach Shuttle travels several times per day between downtown Seattle and Vancouver's River Rock Casino next to the Bridgeport SkyTrain station, three stops from the airport. Travel time is around three hours and fifteen minutes. *Should you want to drive, Park'N Fly offers long-term parking and shuttle service. Vancouver International is in Richmond, a neighborhood with a large number of residents of Asian heritage. Many immigrated in the late 1980s from Hong Kong, Taiwan, and Mainland China. Make the most of your time by taking advantage of the favorable exchange rate, and the shopping, dining and entertainment options along the SkyTrain's Canada Line. Buy a day pass for $10.25 Canadian ($8 U.S.), drop your bags at the airport, and go out and explore. *Relax at the health club in the Fairmont Vancouver Airport hotel. A $20 Canadian ($15.50 U.S.) day pass buys access to the hotel's fitness center, pool, whirlpool, sauna, showers and changing area. For $50 Canadian ($38.50 U.S.), the hotel throws in workout clothing and a healthy snack. 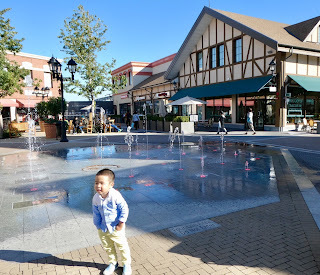 *Shop and dine at the McArthurGlen Designer Outlet mall two stops away from the airport on the SkyTrain at Templeton station. 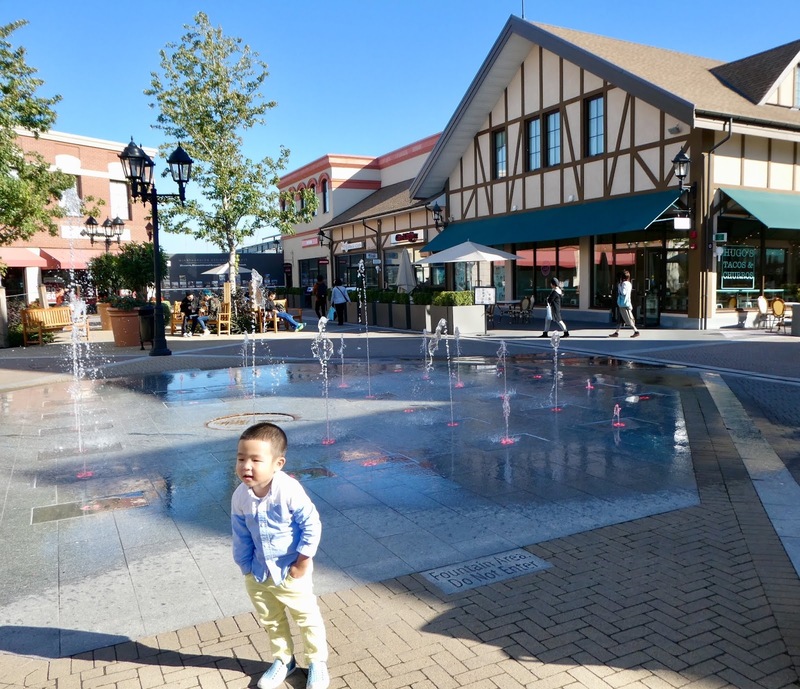 You'll see signs in Chinese and hear jets soaring over the faux copper roofs of a shopping center designed to look as if it's in Paris or Italy. Vancouver's popular Japadog chain has an outlet here (Try the Yakisoba dog topped with Japanese noodles, red pickle, ginger and seaweed). The favorable exchange rate translates to extra discounts at chains such as Columbia Sportswear, J. Crew and Banana Republic. * Try your hand at poker, black jack or play the slots at the River Rock Casino Resort, open 24 hours, three stops from the airport at the Bridgeport Skytrain station. Beer and wine is $5 Canadian ($3.80 U.S.) at Starbucks, Sunday-Thursday from 5 p.m. - 8 p.m.
* Take a trip to Taipei without leaving Vancouver at the Richmond Night Market (Bridgeport station) Fridays, Saturdays and Sundays, starting at 7 p.m. The market is closed for winter, but reopens again next May. * Finally, reserve time to explore the airport itself. Try out the flight simulator in a public observation area, visit the Vancouver Aquarium's marine exhibits and view the airport's large collection of First Nations art.